Paul Revere, ''The Bloody Massacre in King-Street, March 5, 1770.'' Boston, 1770. As a means of generating income for colonial administration, Parliament in 1767 passed the Townshend Acts, which placed duties on paper, lead, paint, and tea imported into the colonies. A boycott engineered by the Americans angered the imperial authorities. Customs officials repeatedly asked for military backing, in the hope that a show of force would enable them to collect duties from reluctant colonists. In October 1768, those pleas were answered and the first soldiers were posted in Boston. Eventually, about 4,000 redcoats, equal to one-fourth of the city&apos;s population, were deployed. 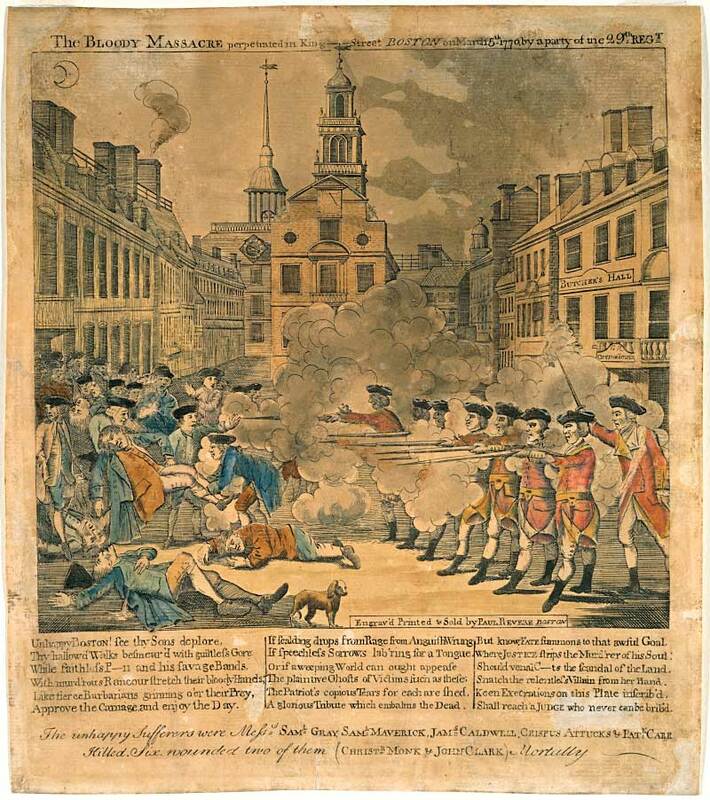 Boston Massacre, 1770, pre-Revolutionary incident growing out of the resentment against the British troops sent to Boston to maintain order and to enforce theTownshend Acts. The troops, constantly tormented by irresponsible gangs, finally (Mar. 5, 1770) fired into a rioting crowd and killed five men—three on the spot, two of wounds later. The funeral of the victims was the occasion for a great patriot demonstration. The British captain, Thomas Preston, and his men were tried for murder, with Robert Treat Paine as prosecutor, John Adams and Josiah Quincy as lawyers for the defense. Preston and six of his men were acquitted; two others were found guilty of manslaughter, punished, and discharged from the army. The Boston Massacre was a street fight that occurred on March 5, 1770, between a "patriot" mob, throwing snowballs, stones, and sticks, and a squad of British soldiers. Several colonists were killed and this led to a campaign by speech-writers to rouse the ire of the citizenry. The Boston Massacre, a pivotal event of the Revolutionary era, emerged from Britain&apos;s attempts to assert greater control over its North American colonies after the French and Indian War. When customs officials complained about abusive Bostonians, the British government assigned four regiments to garrison the town. The Boston Massacre was a climax in American history that erupted from a culmination of events proceeding the occurrence. In 1768, the Commissioners of Customs, a group of men hired in Britain and paid from what they collected in America, were concerned by the resistance they met in Boston and deman ded that Britain send military protection at once. They had cause for concern. The public, having grown outraged over the Stamp Act, passed in 1763, and the more recent flair over the Townshend Act of 1767, were becoming more proactive in their conflict with Britain&apos;s refusal to allow them to tax themselves. Little is known about the early years of Crispus Attucks. He was born a slave around 1723 probably in the colony of Massachusetts. His father, Prince Yonger, was an African and his mother, Nancy Attucks, was an Indian and possible descendant of John Attucks, a member of the Natick Indian tribe. John Attucks was executed for treason in 1676 during the King Philip War. The word "attuck" in the Natick language means deer. In 1750, Crispus was a slave of William Brown of Framingham. Boston Massacre 1770, pre-Revolutionary incident growing out of the resentment against the British troops sent to Boston to maintain order and to enforce the Townshend Acts . The troops, constantly tormented by irresponsible gangs, finally (Mar. 5, 1770) fired into a rioting crowd and killed five men—three on the spot, two of wounds later. The funeral of the victims was the occasion for a great patriot demonstration. The British captain, Thomas Preston, and his men were tried for murder, with Robert Treat Paine as prosecutor, John Adams and Josiah Quincy as lawyers for the defense. Preston and six of his men were acquitted; two others were found guilty of manslaughter, punished, and discharged from the army. The Boston Massacre refers to an incident involving the deaths of five civilians at the hands of British troops on March 5, 1770, the legal aftermath of which helped spark the rebellion in some of the British colonies in America, which culminated in the American Revolution. A tense situation because of a heavy British military presence in Boston boiled over to incite brawls between soldiers and civilians and eventually led to troops discharging their muskets after being attacked by a rioting crowd. Three civilians were killed at the scene of the shooting, and two died after the incident. If you were living in Boston at the time, this is what you would have read in the Boston Gazette and Country Journal in its edition of Monday, March 12, 1770. The actual account as reported and published in the pages of that newspaper follows. Here is the complete text of the account of the Boston Massacre as reported in the Boston Gazette and Country Journal on Monday, March 12, 1770. Since the Stamp Act of 1765, street violence in Boston had become commonplace. Riots and protests had been instrumental in securing the repeal of the Stamp Act in 1766. Street protests continued on through the late 1760s. Customs officials in the colonies pleaded with the British crown to send soldiers to maintain order. By October 1768 Boston was home to 4,000 British troops, about a quarter of the city&apos;s population. The Boston Massacre occurred on March 5, 1770, when British soldiers fired into a crowd of colonists who had been throwing snowballs at the soldiers. The altercation was instigated because the soldiers, who were being quartered in Boston, were taking jobs the from the colonists. The Massacre began when a soldier shot Crispus Attucks and resulted in the deaths of four other colonists. The town of Boston was a very uneasy city throughout the 1760&apos;s. This uneasiness quickly turned to belligerence in the early part of 1770. Tensions had been mounting from the beginning of the year with various clashes between British sympathizers and colonists. However, in early March the tensions erupted into bloodshed. The Boston Massacre (the killing of five men by British soldiers on March 5, 1770) was the culmination of civilian-military tensions that had been growing since royal troops first appeared in Massachusetts in October 1768. The soldiers were in Boston to keep order in face of the growing discontent with the heavy taxation imposed by the Townshend acts. But townspeople viewed them not as order keepers but as oppressors and threats to independence. Brawls became common. The reenactment of the Boston Massacre is an annual event organized in Boston on the anniversary of the historic conformation, March 5th. As you can see from the video, the reenactment closely follows the historic facts, as it is organized by the Boston Historical Society. The event takes place on the exact site of the Massacre at the intersection of State and Devonshire streets in downtown Boston. When Paul Revere first began selling his color prints of "The Bloody Massacre perpetrated in King Street" in Boston, he was doing what any like-minded patriot with his talents in 1770 would have done. Only, Paul Revere did it faster and more expeditiously than anyone else, including two other artist-engravers who also issued prints of the Massacre that year. Tensions between the American colonists and the British were already running high in the early spring of 1770. Late in the afternoon, on March 5, a crowd of jeering Bostonians slinging snowballs gathered around a small group of British soldiers guarding the Boston Customs House. The soldiers became enraged after one of them had been hit, and they fired into the crowd, even though they were under orders not to fire. Five colonists were shot and killed. Although it has been over two centuries since the moonlit March night in 1770 when British soldiers killed five Bostonians on King Street, people still debate responsibility for the Boston Massacre. Does the blame rest with the crowd of Bostonians who hurled insults, snowballs, oysters shells, and other objects at the soldiers, or does the blame rest with an overreacting military that violated laws of the colony that prohibited firing at civilians? Whatever side one takes in the debate, all can agree that the Boston Massacre stands as a significant landmark on the road to the American Revolution.Although it has been over two centuries since the moonlit March night in 1770 when British soldiers killed five Bostonians on King Street, people still debate responsibility for the Boston Massacre. Does the blame rest with the crowd of Bostonians who hurled insults, snowballs, oysters shells, and other objects at the soldiers, or does the blame rest with an overreacting military that violated laws of the colony that prohibited firing at civilians? Whatever side one takes in the debate, all can agree that the Boston Massacre stands as a significant landmark on the road to the American Revolution. THE HORRID MASSACRE IN BOSTON, PERPETRATED IN THE EVENING OF THE FIFTH DAY OF MARCH, 1770, BY SOLDIERS OF THE TWENTY-NINTH REGIMENT WHICH WITH THE FOURTEENTH REGIMENT WERE THEN QUARTERED THERE; WITH SOME OBSERVATIONS ON THE STATE OF THINGS PRIOR TO THAT CATASTROPHE It may be a proper introduction to this narrative, briefly to represent the state of things for some time previous to the said Massacre; and this seems necessary in order to the forming a just idea of the causes of it. The Boston Massacre (the killing of five men by British soldiers on March 5, 1770) was the culmination of civilian-military tensions that had been growing since royal troops first appeared in Massachusetts in October 1768. The soldiers were in Boston to keep order, but townspeople viewed them as potential oppressors, competitors for jobs, and threats to social mores. Brawls became common. After Parliament passed the Stamp Act in 1765, violence and intimidation against English customs agents heightened. It subsided with the repeal of the Stamp Act. With the passage of the Townshend Act, though, violence increased since it was viewed as a successful tactic. In 1768, officials requested military protection and on October 1, 1768, British soldiers arrived in Boston and established a garrison. For months tensions built while mobs antagonized the soldiers who were posted outside public offices. The Boston Massacre is an event that occurred on Monday, March 5,1770 that helped spark the American Revolution. Tensions caused by the military occupation of Boston increased as soldiers fired into a crowd of civilians. John Adams quoted that on the night of the Boston Massacre, the foundation of America was laid. Even the worst offender, even the most unpopular cause, deserves a good lawyer. Our example is a passionate moment in Boston on the eve of the Revolution, when John Adams undertook to defend the hatred British soldiers who had fired into a Boston mob and created some “martyrs.” There are echoes of our own times in the trial that followed. In June 1767, Parliament passed the Townshend Acts, which levied import duties on articles including tea, lead, glass, paint, and paper and established a Board of Customs Commissioners for America to be stationed in Boston. Bostonians protested the import duties by encouraging nonimportation and non consumption movements in the colonies. In February 1768, the customs commissioners asked Parliament to guarantee their safety as they carried out their duties in Boston. Troops began arriving in October of that year. Many Bostonians resented the presence of the standing army in their town, and patriot leaders made concerted efforts to feed the population&apos;s animosity toward the soldiers. Fresh wet snow had fallen, and on Monday evening, the 5th of March, frost had covered the streets of Boston with a coat of ice. The moon was in its first quarter and shed a pale light over the town, when, at twilight, both citizens and soldiers began to assemble in the streets. By seven o&apos;clock full seven hundred persons, armed with clubs and other weapons, were on King (now State) street, and, provoked by the insolence and brutality of the lawless soldiery, shouted: "Let us drive out these rascals! They have no business here--drive them out!" On the evening of March 5, 1770 a group of Boston residents gathered at the local customs house to demonstrate their anger over the various taxes Parliament had recently imposed upon the colonies. Tensions between the Royal soldiers that protected the customs house and the locals had been increasing since the troops had been dispatched to Boston two years earlier.